Farrar Straus Giroux, 9780374289942, 449pp. Italians love to talk about food. The aroma of a simmering "ragu," the bouquet of a local wine, the remembrance of a past meal: Italians discuss these details as naturally as we talk about politics or sports, and often with the same flared tempers. In "Why Italians ""Love to Talk About Food," Elena Kostioukovitch explores the phenomenon that first struck her as a newcomer to Italy: the Italian "culinary code," or way of talking about food. Along the way, she captures the fierce local pride that gives Italian cuisine its remarkable diversity. To come to know Italian food is to discover the differences of taste, language, and attitude that separate a Sicilian from a Piedmontese or a Venetian from a Sardinian. Try tasting Piedmontese "bagna cauda," then a Lombard "cassoela," then lamb "ala Romana" each is part of a unique culinary tradition. In this learned, charming, and entertaining narrative, Kostioukovitch takes us on a journey through one of the world's richest and most adored food cultures. Organized according to region and colorfully designed with illustrations, maps, menus, and glossaries, "Why Italians Love to Talk About Food "will allow any reader to become as versed in the ways of Italian cooking as the most seasoned of chefs. Food lovers, history buffs, and gourmands alike will savor this exceptional celebration of Italy's culinary gifts. Elena Kostioukovitch was born in Kiev in 1958, studied in Russia, and moved to Italy in 1988. She is an essayist, translator, and literary agent. Her 1988 translation of Umberto Eco's "The Name of the Rose "was a literary sensation in Russia and led to a longtime collaboration with Eco. Since 1988, she has been the editor of the Russian series for Bompiani/RCS Publishers, and, since 1996, of a series from Edizioni Frassinelli. She isthe recipient of numerous prizes, including the Welcome Prize (2006), given by the Russian National Association of Restaurateurs. 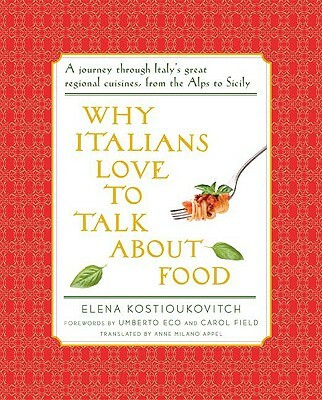 In 2006 Kostioukovitch published "Perche agli Italiani piaci parlare del cibo "("Why Italians Love to Talk About Food"). A bestseller in Italy and Russia, the book received the Bancarella della Cucina award and the Chiavari Literary Award in 2007. Kostioukovitch lives with her husband and two children in Milan.